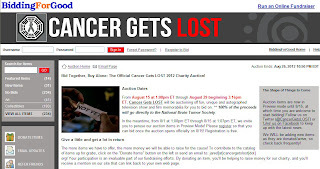 I thought that there wouldn't be any more action on this blog (not until a new series of LOST is created anyway) but I was wrong. You will not want to miss this event and will definitely start to salivate at all the items available. If you needed any more persuation to take a look at the items available Damon Lindelof kindly created a short video message about the cause. 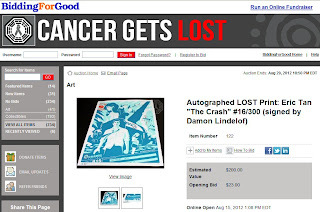 Now for the reason this is very relevant to LOSTARGS, amongst the items for auction there are several LOST poster series items, variously signed by Damon Lindelof and Carlton Cuse, Jorge Garcia and more. This maybe your last chance to get these posters at anywhere near their original value and some are prints that were never previously available to the public. For example there is a copy of The Swan Station by Rob Jones available which is #8/300, and a copy of Eric Tan's The Crash which is #16/300. It isn't just the Gallery 1988 art series that is for sale there are originals by Dr Mikey Studios, signed prints by J.J. Harrison and even a Zort70 Alcatraz poster ! The amount of items is stunning for a LOST fan and my problem will be to know where my bank balance can be stretched to without completely breaking. That isn't all that will be happening in the next few weeks, look out for another post from us on Monday to see how else you can help the cause and get something, I hope is fairly cool, in return. first ! I haven't gotten to say that in ages lol I'm loving this auction that Jo is doing since it's near and dear to my .... head. I have a brain tumor too and was going to have surgery yesterday till it was canceled last minute by the doctor's office. To say I'm a bit stressed is a understatement ! Thanks for all that are donating and helping out !! and dang it all, it didn't click the email button the first time ! Really looking forward to the auction and to your special surprise, Zort! Feels good to post on LostARGs again too. Hi Lisa, good to hear from you hope things work out for you. Hi Rob, it felt a bit odd to create a new post here, but good at the same time.